The time has come to move. Santina's health cleared up, her quarantine is over, and Kili/Truman are ready to go. 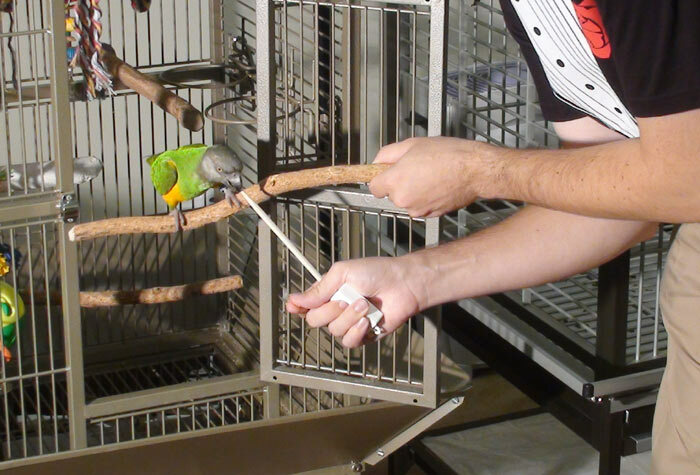 In a previous article I wrote about how I set up Kili & Truman's new aluminum Kings Cages. The only thing missing was toys and birds. Kili & Truman buckled up their harnesses and rode on my shoulders the few blocks to the new house. I had a bug problem at the old apartment so I've been leaving as much behind as possible and only bringing clean things. This is why Truman's old aluminum cage had to be abandoned and not because there was anything else wrong with it. This is also why I opted to move the birds wearing harnesses rather than carriers. We walked in through the bird room door and surprised Santina. She was sitting on the edge of her stand, excited to have company. Santina watched eagerly as her first bird visitors were settling in to the room next door. 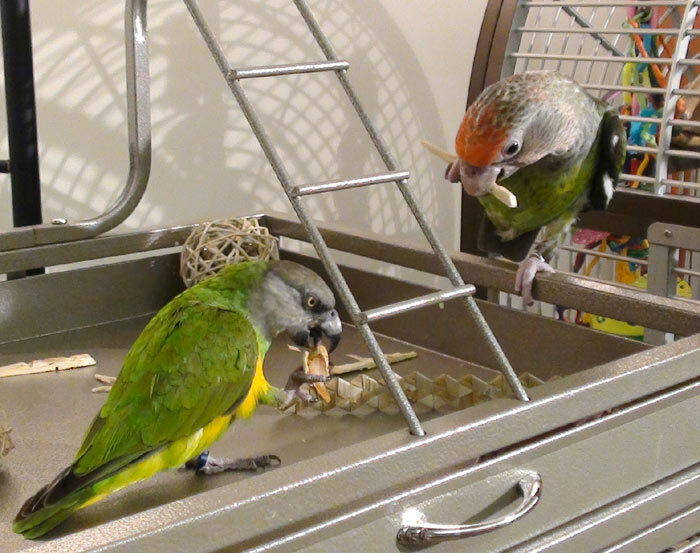 Kili & Truman watched me assemble water bottle holders, mount perches, and add toys to their bare cages. I bought two water bottles for each cage and mounted both brackets. Although I will normally only be using a single water bottle, when I need to go away for a weekend I will be able to leave twin water bottles for the unlikely event of a failure (in 5+ years using water bottles for my birds I have not had a problem). 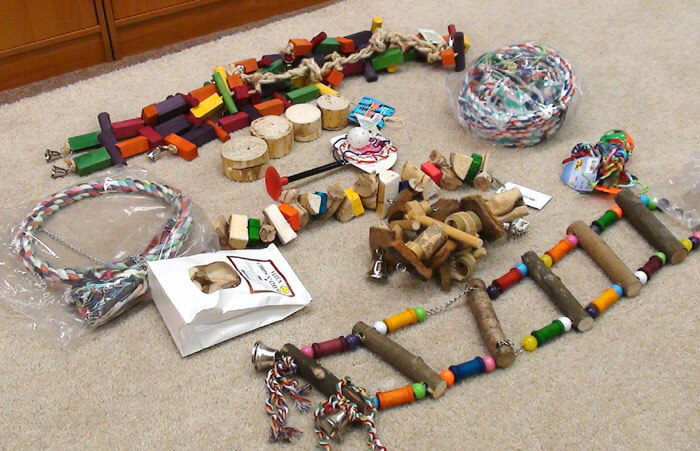 The parrots sampled the toys as I was putting them into their cages. Truman gave his approval for a long strand of stars and Kili immediately began chewing up a cute shredding toy. 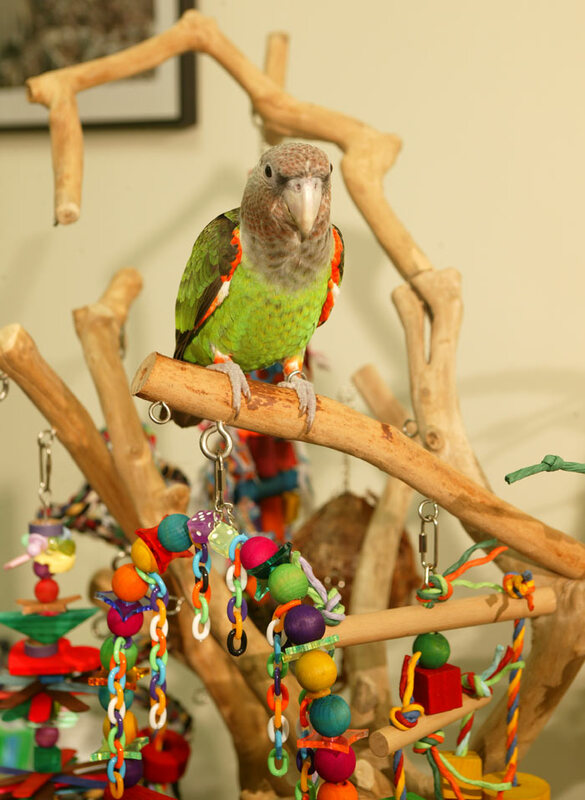 These parrots love new toys, places, and situations. This is why it was an absolute non-event to move them to a new house. They have not shown the slightest sign of upset such as not eating, being quiet, or just inactive. The reason it was so easy to move to a new house with my parrots without them freaking out is because we have already done this plenty of times before! Every outing, every trip, every household change we have ever made was a preparation for the unknown but inevitable eventual move. 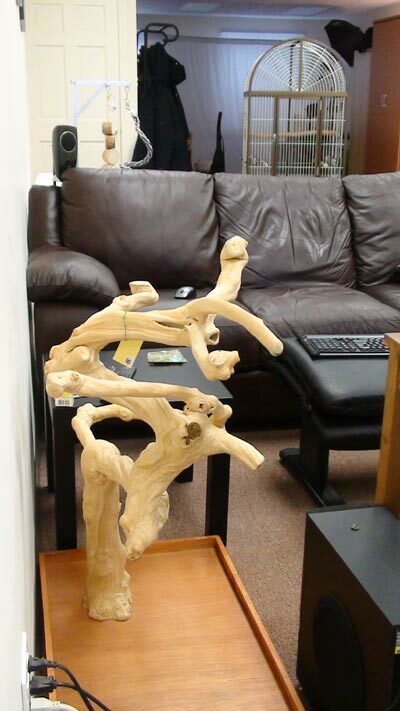 People often ask me "I am moving to a new house tomorrow, what can I do to make it easier for my parrot?" At that point it is already too late. 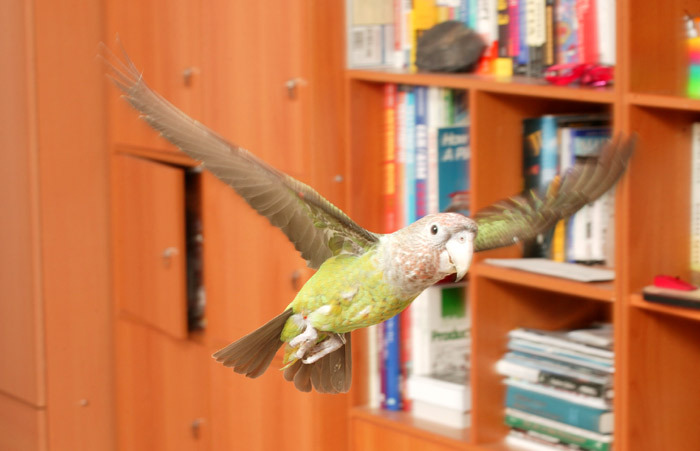 The time to begin preparing your parrot for a move is now. I occasionally took Kili and/or Truman with me to visit other people's houses. I took the birds for drives and outings. 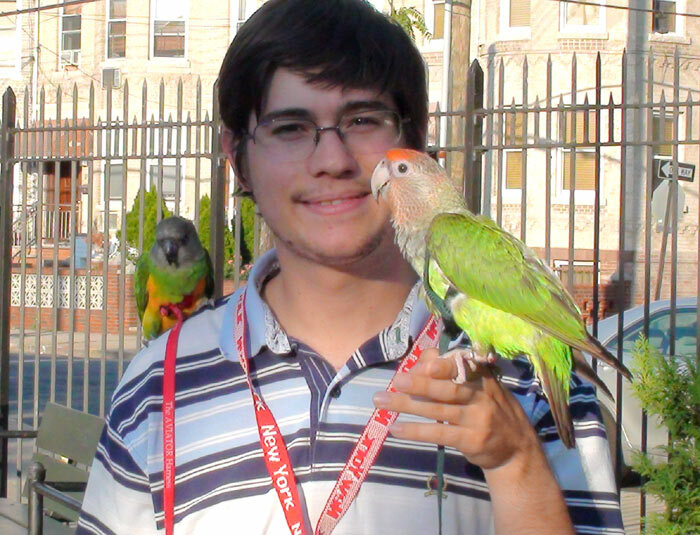 I had the parrots living out of their travel cages during trips and when we went camping. I even had the parrots living in completely different bird cages when we were visiting Ginger's Parrots Rescue. All of these different encounters prepared Kili & Truman to live in any sort of cage or house. And since they get excited about new toys, moving to a new cage with new toys is an opportunity rather than a burden for them. Not long after I had the birds on top of their respective cages, Kili hopped over to Truman's cage and kicked him off to the smaller one. The funny thing is that the first time I let them out since, the first thing Truman did was to go and climb up into Kili's cage and stay there. It was as though she convinced him that if he just yields the bigger cage to her that she won't beat him up for it. 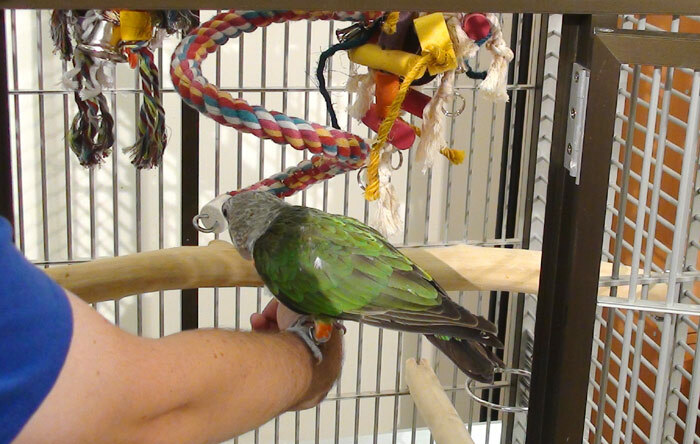 As for Santina, well she came from a rescue so she was already used to other birds. I could tell that Santina was excited to see other birds around and not upset. Kili & Truman have been to places with other parrots so to them it was no surprise to see a big bird next door. The move was such a non-event that it makes for a boring story. But that's what you want it to be. So begin preparing your parrot for any sorts of unforeseen changes by socializing and traveling with your parrot now.